Back in January, we did something we rarely do in the depths of winter - we headed for the heart of New England, an area we usually try to visit in pretty much any other season but winter. In this case, though, we were racing against time: with the Providence TV market sticking to the original February 17, 2009 deadline to shut down their analog signals, we wanted to capture as much as we could of the market's TV infrastructure while the analog stations were still there. You saw those photos here on Site of the Week a few months ago - but they were just part of a busy, slushy, frigid day for us in Providence that also included plenty of the city's radio sites. In particular, we finally got the chance to do something that had eluded us on previous visits to Rhode Island: we got together with the chief engineers of the two big radio clusters in town, Clear Channel and Citadel, to get inside their transmitter sites for visits and pictures. In this week's installment, we head just a little south and east down Wampanoag Trail from the two fat towers of WHJJ 920, over to that talk station's biggest competitor - Citadel's WPRO (630). 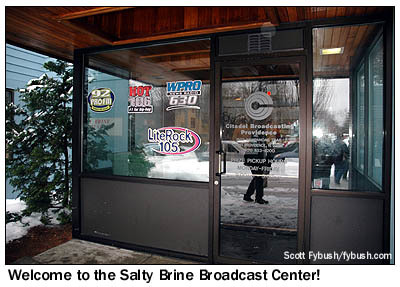 In an earlier installment of Site of the Week, we looked at their building and towers from outside...but this time, chief engineer Duffy Egan is here and waiting to show us around inside the "Salty Brine Broadcast Center," the studio/transmitter complex named for WPRO's longtime morning voice. While the building - a two-story wood-sided affair, painted blue - looks relatively recent from the outside, it conceals a much older core: this facility was actually built back in 1938 as a transmitter site for WPRO, whose studios were then in downtown Providence at the Cherry & Webb department store, which owned the station for decades. It wasn't until 1974 that then-owner Capital Cities, which had sold off the former WPRO-TV (now WPRI, channel 12), moved the studios out of downtown. The former radio-TV studio building at 24 Mason Street was donated to public broadcaster WSBE (Channel 36), WPRI built new digs in East Providence off I-195, and WPRO and WPRO-FM (92.3) added on - and up - to the transmitter building out here. 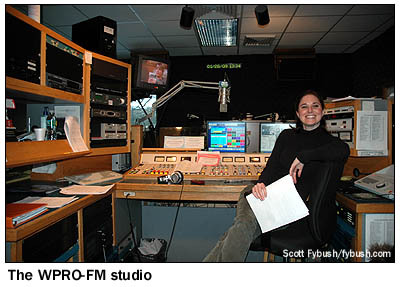 Walk into the lobby, and the WPRO-FM studio is prominently visible through a big window behind the receptionist. 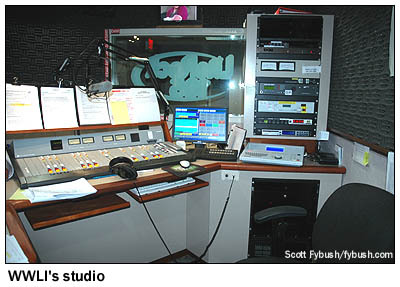 With the growth of Citadel's cluster here, what was once a full suite of first-floor studios for the FM now serves two stations: hip-hop "Hot" WWKX (106.3 Woonsocket) operates out of a former production room down the hall, and there are several smaller spaces in between for production and traffic. 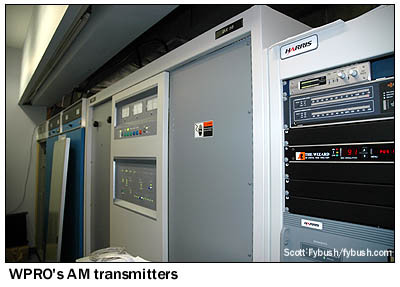 Across the hall, the old WPRO transmitter building from 1938 is now a transmitter room enclosed by the new building, and today a Harris DX10 serves as WPRO's main transmitter, with an MW-5 for backup and a densely-packed wall of equipment nearby to serve all the stations in the cluster. 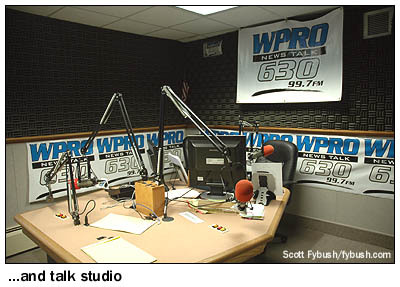 Upstairs, the front of the building is lined by the newsroom and studios for WPRO (630), which had recently added an FM simulcast when we visited in early 2009. 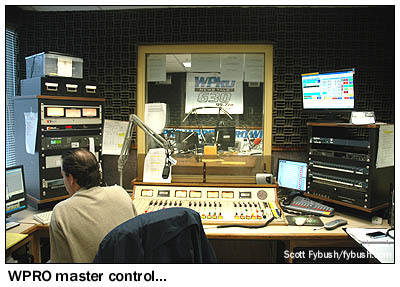 WEAN (99.7 Wakefield-Peace Dale) resurrects the historic calls of one of WPRO's venerable competitors, which occupied the 790 AM facility that's now also part of the Citadel cluster. 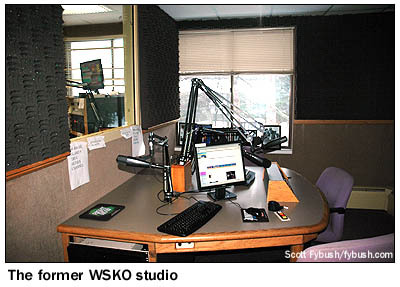 790 and 99.7 had until recently been paired as sports talker WSKO/WSKO-FM, but Citadel pulled the plug on "The Score" in 2008, flipping the AM side to "True Oldies Channel" under the calls WPRV. 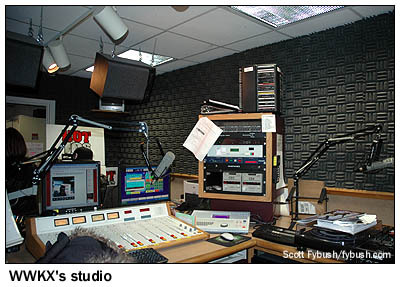 The former "Score" studios occupy a space just down the hall from WPRO(AM)/WEAN, and not long after our visit the 790 format was changed again, to business talk, still using this small control room and studio for local programming. Across the hall from 790 is the final FM in this cluster: WWLI (105.1), longtime FM sister to 790. Back in the day, when 790 was WEAN, 105.1 was WPJB, reflecting then-owner the Providence Journal-Bulletin. Today, it's "Lite Rock 105" - and if you want to see where it and WPRO-FM transmit from, go check out our Neuticonacanut Hill visit here. Thanks to Duffy Egan for the tour! Site of the Week INDEX! How can you help support Site of the Week? Click here! Submit your suggestions for a future Site of the Week!